The Femundlopet is a long distance race in Norway. The race starts in 2 classes: the limited (8 dogs) over approx. 300 km (10 houres mandatory rest), and the open class (12 dogs) over approx. 530 km (16 houres mandatory rest). The obligatory rests which are stipulated by the race-officials can be splitted on different checkpoints. There are a few checkpoints who are away from each other on a distance from 40 to 115 km and only one depot (Femundtunet) for dogfood and equipment. As I broke my hand during the training for Femundlopet 2000, I set everything on the year 2001. The extensive preparations begun already in the summer with getting dogcoats, cooker (thanks to Gerhard Hirz for his cooker which has been proved under extrem conditions) and enlarging the bootie-stock. The training in autumn proceeded well, except a few interruptions due high temperatures, until the beginning of december. The training with the Quad had to be screwed back due to worn-out paws. 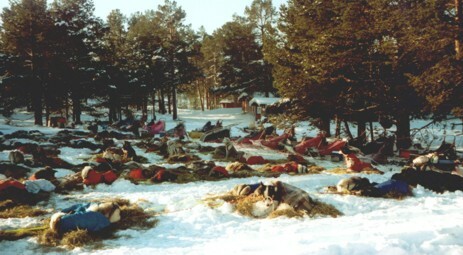 On the 25th December begun the snow-training at Stefan Falter in the swedish Särna. There were enough snow, the training could be organized varied through the different trail-possibilities. Relatively fast I was able to train on distances of 50 km, thanks to the good preparations in autumn. In the middle of January, the norwegian middle-distance-championship over 2x 62 km was chosen for the final rehearsal. 1. place: Peter Swift, 2. place: Stefan Falter, 3. place: Kurt Pichler. Two weeks before the saison´s highlight we trained almost in deep snow only, due to heavy snowfalls. After training-runs of 88 - 65 - 55 km with 6 hours break each, the last 3,5 days before the race I left the dogs resting. On the 2nd February we made the 200km trip from Särna to Röros. We had temperatures of -30 degrees C, and the weather forecast let us expect even lower temperatures. My start was at 12:14. 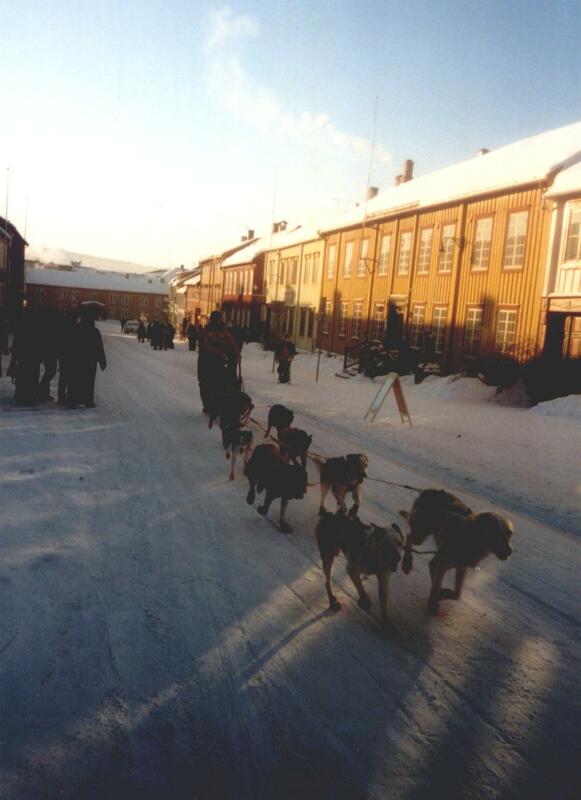 I decided to let the dogs in the race without their dog-coats, and put them in the already overloaded sledge. The first stage began in Röros (the start took place in the middle of town) and led 40 km to Langen. Despite of the heavy sledge the dogs were very fast, and so we were on the arrival in Langen on the 14th place out of 52 Team. In Langen we had to break, ordered by the race-officials, with the issue to compensate the difference in the start-timings. I used this break to change the booties, put the dog-coats on and make warm dogfood for the next checkpoint. I was able to leave Langen at 16:51, heading for Tufsingdalen (53 km distance). The trail led back to Röros and then turned to South, over Gradalen, which represents the toughest part of the race because of the sloping rides. During the break of 2 houres, which I have foreseen in my race-strategy, I fed the dogs, removed the booties and tried to ease the pain in my right eye (my sight was extremely empoverished after crossing Gradalen). At -36 Degrees C I left Tufsingdalen at 22:35 to go the next 75 km to Femundtunet. Few kilometers after the start begun a large inclime on the Krennvikhogda. After a large downhill and crossing the street to Röros followed a few kilometers along the Femundsea. The profile of the stage changed between sea- (were the low temperatures were extremely perceptible) and hilly forest tracks. Before arrival on the checkpoint, I decided, after a 6-hour-break, to leave for the way back. On the arrival in Femundtunet I was told that the race is stopped until further notice, and that there is a Mushermeeting at 10:00. The reason for the interruption were the low temperatures measure on the Femundsea, down to -52 Degrees C. On Sunday afternoon we finally left for Tufsingdalen. I arrived there at 21:05 and was ordered to make a break of 5:49. I decided there, unfortunately too early, to put two Yearlings out of the team and to race the remaining 45 km to Röros with 6 dogs. I could have left Tufsingdalen at 02:54 heading for the finish, but was impedded by a limping dog. I called for a veterinarian, who checked the dog, but could not find anything extraordinary. With a 25-minutes-delay and 2 places behind I got back on the track and arrived in the finish on Monday at 06:50 on the 6th place. In despite of my scepticism of bringing a very young team on the start, my expectation (I only wanted to reach the finish) were exceeded due to an extraordinary performance, because the team was one of the fastest in all the stages.